Doris Irene Adams, 99, of Holton, passed away Thursday, Jan. 31, 2019, at Medicalodges Jackson County in Holton. She was born March 26, 1919, in Granada, the daughter of Roscoe and Artemicia “Artie” (Williams) Guffy. Doris attended grade school in Granada. She was a homemaker, worked for Slimaker Dress Factory in Holton and also for Sutton’s Deli in Topeka. Doris’s passion was cooking; she assisted with many funeral dinners at Larkinburg Christian Church. She also enjoyed reading her Bible. Doris married Leonard Andrew Adams on Oct. 29, 1937, in Horton. They celebrated more than 47 years of marriage. He preceded her in death on April 7, 1985. She was also preceded in death by a daughter, Carol Naftzger; a son, Harold Adams; five sisters, Marjorie Coanda, Ruth Prevatte, Vivian Reeves, Mildred Banks and Gladys Bontrager; and four brothers, Boyd, George, Keith and Wesley Guffy. 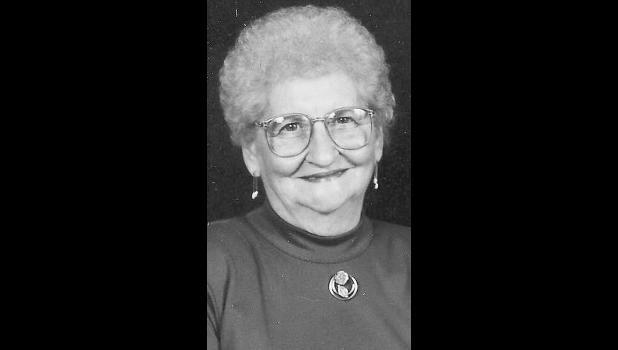 Survivors include her daughters, Virginia Monson and Sharon Bohannon (Bill), all of Holton; her brother, Max Guffy of Topeka; 11 grandchildren; 15 great-grandchildren; and 22 great-great-grandchildren. Funeral services will be held at 11 a.m. Thursday, Feb. 7 at the Larkinburg Christian Church. Private family burial will be held at a later date in Wetmore Cemetery. Doris will lie in state through Wednesday at Mercer Funeral Home in Holton.